Following cancellation on March 3, 2018 due to extreme wind, Ballyshaners, a nonprofit that aims to promote and preserve Irish heritage, is pleased to announce that the show will go on during the rescheduled 37th Annual Alexandria St. Patrick’s Day Parade happening Sunday, March 18, 2018 at 1:30 p.m. Visitors and residents are invited to don their green and line King Street in Old Town Alexandria. Participants will include Irish dancers, bands, community groups and more. Parade-goers come early for the Fun Dog Show on Market Square. This year’s fun dog show benefits the Animal Welfare League of Alexandria and features costumed dogs competing in a range of categories, including Best Human/Canine Look-Alike, Most Talented and Most St. Paddy’s Spirit. Each of the winners will receive a 2018 “Pet” Troy Award Trophy, in honor of this year’s Grand Marshalls, Pat and Bernadette Troy. The dogs will then kick off the parade. Named the #1 Best U.S. Travel Destination 2018 by MONEY, a Top Romantic City and a Top Dog Friendly City, Alexandria hums with a cosmopolitan feel and a walkable lifestyle—a welcoming weekend escape next to our nation’s capital. 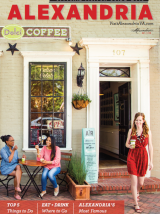 A nationally designated historic district founded in 1749, Old Town Alexandria hums with more than 200 independent restaurants and boutiques alongside intimate historic museums and new happenings at the waterfront. At the heart of it all is bustling King Street, a walkable mile recognized as one of the “Great Streets” of America. New restaurants tucked in to 18th- and 19th-century architecture still intact from the city’s days as George Washington’s hometown ignite historic and off-the-beaten-path neighborhoods as the waterfront district evolves with new energy.